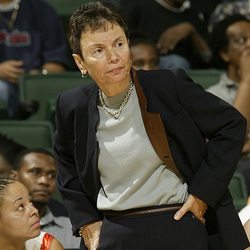 Ferne Labati became the head coach of Woman's basketball at the University of Miami in1988. Her enthusiasm and drive are legendary. Eternally optimistic, she has built a career at UM second to none. She has the most wins of any UM Women's basketball coach as well as the highest winning percentage. She took her 2003-2004 team to the NCAA Tournament. Highlighting her 15 seasons are nine berths in postseason play, six in the NCAA tournament and three in the Women's NIT. The Lady Canes won back-to-back BIG EAST regular season and tournament titles in 1992 and 1993, while finishing as high as No. 6 nationally. Her 1996 squad earned a share of the BIG EAST 7 division title. Labati herself was named WBCA/Converse Coach of the Year in 1992. Labati's record at Miami stands at 290-179(.618) while her overall record in 26 seasons as a head coach is 426-301(.586). Though her success on the court is impressive, what she has accomplished off the court might serve as her legacy at the University of Miami: In her 15 previous seasons, 40 of the 41 student-athletes that completed their eligibility at Miami have graduated.